Report on the wine tasting presented by the Rhone Rangers North Coast Chapter, on Sunday March 23rd, 2014, at the Napa Valley Museum in Yountville. This tasting focused on current releases of Rhône-varietal wines from member wineries. 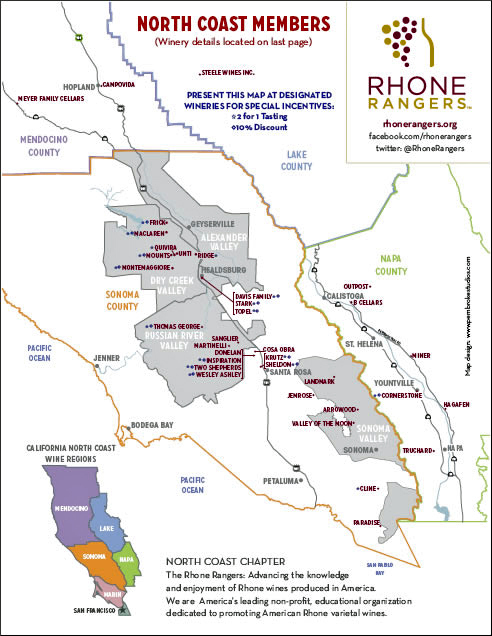 The North Coast Chapter of the Rhone Rangers organization serves to promote Rhône-style wines from producers in Sonoma, Napa, and Mendocino counties, and to help educate trade, media, and consumers about those wines and wineries. William Allen of Two Shepherds Vineyards is the current North Coast Chapter President. 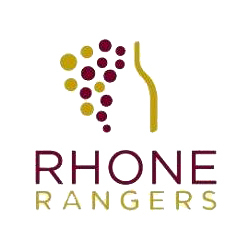 The Rhone Rangers North Coast Chapter has held a number of small tastings over the past year, but this was the first one I was able to attend. This tasting brought together some well-known producers as well as several with which I was not familiar. The small size of the event made it possible for me to taste nearly all the wines that were presented and to check out more wineries that were new to me than I’m sometimes able to do during the large Rhone Rangers tasting. 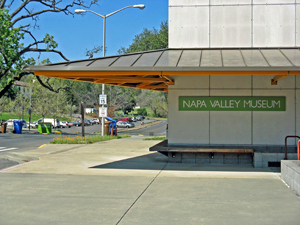 The Napa Valley Museum is housed in a striking modern building, and it worked very well for the size of this event – even with what looked to be a good turnout, the space never felt overly crowded. In addition to the winery tables, bread and cheeses were available on another large table, and Bert’s Desserts of Petaluma offered samples of different chocolate truffles. 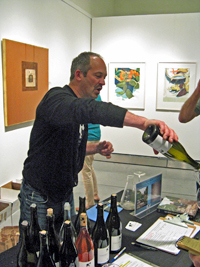 The venue was also ideal in that the museum was exhibiting artwork by vintners, growers, and winery owners, several of whom poured at the tasting. Called “Thinking Outside the Bottle,” the exhibit included artwork by Kate Solari Baker of Larkmead, Heidi Barrett of La Sirena, Eleanor Coppola of Inglenook, Layla Fanucci of Charter Oak, Blair Guthrie of Stewart Cellars, Richard Mendelson of Mendelson Wines, Margrit Mondavi of Robert Mondavi Winery, Shauna Rosenblum of Rock Wall, Kasandra Weinerth of Valley Girls, and Nile Zacherle of Zacherle Wines. I tasted wines from 16 producers at this event. As usual, I did not try to taste whites and Rosés first and then go back for the reds. Despite some drawbacks – the first two wines of the day that I tasted were among the biggest reds being poured – I’ve found this method to be a more efficient use of time. And another advantage is that interspersing tastes of some lighter and higher-acid white wines amongst the big, tannic reds serves as a good palate refresher. This tasting presented a strong group of producers, many of them sourcing their fruit from cooler-climate vineyard sites on the North Coast. A number of 2013 whites and Rosés made my favorites list – they showed quite well for having been bottled so recently, and I suspect I may have enjoyed them even more since they were such refreshing breaks from the many big red wines being poured. Most of the day’s reds were Syrahs or Syrah-based blends, and that’s reflected in my list of favorites. For whatever reason, I didn’t feel that the Grenache-based wines showed quite as well, but perhaps that was a matter of where my palate was at that day. Nearly all of my favorite reds were from the cool 2010 and 2011 vintages, and most came from cooler-climate vineyards. On the subject of cooler-climate vineyards, I should mention the sad passing of noted vineyard owner and long-time champion of Sonoma County agriculture Saralee Kunde earlier this year. 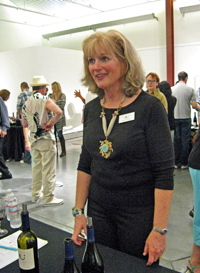 A number of the wines poured at the event were sourced partly or entirely from her famed Saralee’s Vineyard in the heart of Russian River Valley. Although the vineyard was sold to Jackson Family Wines in late 2012, Saralee’s hard work over the past 25 years will continue to be reflected in the all wines made from that site. Overall favorite wineries at this small tasting included Kale and Petrichor, two producers that have impressed me in the past and did so once again with their latest wines. I thought that the Two Shepherds wines took a step up with their new releases. Of producers whose wines I’d never tasted before, Kieran Robinson, Lightning, and MacLaren stood out. All three are fairly new wineries, and I thought that the wines from Lightning were especially noteworthy. I will make an effort to taste more wines from this trio of new and “under the radar” producers. This tasting of the Rhone Rangers North Coast Chapter was very enjoyable. The smaller size and relaxed atmosphere of the event were a nice change from many other tastings, and it’s always exciting to find producers that are new to me and are making standout wines. And given the timing of this particular tasting, it provided a great preview to the upcoming large Rhone Rangers event to be held in the Bay Area. It will certainly be worthwhile to keep on the lookout for the next tasting held by this organization. Arrowood 2011 Viognier, Saralee’s Vineyard, Russian River Valley. Fermented and aged in used French oak barrels. Light straw color, with aromas of stone fruit and spice. Medium-bodied with a fairly smooth mouthfeel and finish. Arrowood 2011 Syrah, Saralee’s Vineyard, Russian River Valley. 100% Syrah, aged in 35% new French oak. Medium-dark purple color, this featured plum and darker berry fruits, a touch of black pepper, plus lots of chocolate and sweet oak on the nose. Medium weight on the palate, this finished with moderate tannins. Comments: Richard Arrowood launched his eponymous winery in 1986. He’s had a long history in Sonoma County wine, becoming the first winemaker at Chateau St. Jean in 1974. Arrowood has been making Viognier from Saralee’s Vineyard for 20 years and Syrah from there for nearly as long. 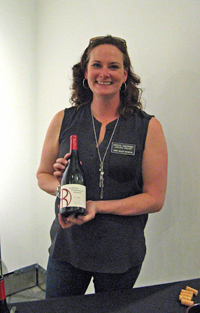 Winemaker Heidi von der Mehden joined Arrowood in 2007 and has been their head winemaker since mid-2010. Stepping Stone 2013 Rosé, “Corallina,” Napa Valley. From 100% Syrah from the Oak Knoll District, farmed specifically for Rosé, whole-cluster pressed and aged in neutral oak. Light pink, with aromas of watermelon and touches of spice and fresh herbs. Medium-light weight with a fairly smooth mouthfeel and finish. Stepping Stone 2011 Syrah, Napa Valley. 95% Syrah, 5% Merlot, all from Carneros, aged in about 40% new oak. Dark color, showing dark berry fruit, chocolate, baking spices, and undertones of vanilla/oak. Medium-rich texture with refined tannins on the finish. Comments: Mike Dragutsky founded Cornerstone in 1991, and in 2008 he was joined by Craig Camp and Jeff Keene. Best-known for their fine Napa Valley Cabernets, Cornerstone has also made Willamette Valley Chardonnay and Pinot Noir in recent years. Stepping Stone is a second label for more value-priced wines and includes their Rhône-style bottlings. Donelan 2012 “Venus,” Sonoma County. 97% Roussanne from Dry Stack Vineyard in Bennett Valley, 3% Viognier from Green Valley, made in stainless steel and older oak. Light straw/gold color, with ripe pear and stone fruit aromas, earth, and spice. Medium-rich texture on the palate, this finished with a chalky mineral character, nice. Donelan 2011 “Cuvée Christine,” Sonoma County. 100% Syrah sourced from four vineyards, 35% whole-cluster fermented, aged in about 30% new oak. Medium-dark color, this had dark berry fruit, vanilla/oak, mocha, and spice on the nose. Medium weight with good structure in the mouth, finishing with firm tannins. Donelan 2011 Syrah, Walker Vine Hill, Russian River Valley. 100% Syrah, 45% whole-cluster fermented, aged in 35% new oak. Medium-dark purple, displaying more herb and pepper character upfront, plus blackberry fruit and hints of chocolate and smoke, and less overt oak than the previous wine. A bit bigger on the palate than the previous wine, with a lively texture and a grippy tannic finish. Comments: Joe Donelan established his label in 2009 after splitting with former business partner Pax Mahle. Joe’s sons Tripp and Cushing head up the winery’s sales and marketing, and Joe Nielsen is the winemaker. 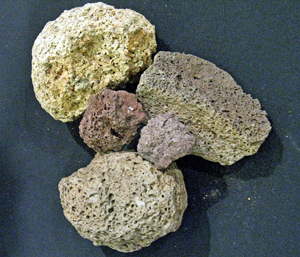 Although they produce several other wines as well, they’re known mainly for their Syrahs, many of them sourced from cooler-climate vineyard sites. Joe Nielsen poured the Donelan wines at the tasting. Don Ernesto 2013 Vin Gris Rosé, Napa Valley. Syrah Rosé, made entirely in stainless steel, bottled in February. Medium-light pink color, with aromas of black cherries and fresh herbs along with floral notes. Medium-light texture on the palate with a slightly chalky tannic bite on the finish, nice. Don Ernesto 2012 “Collage,” Lodi. 80% Roussanne, 20% Marsanne. Light straw/gold color, this showed lots of vanilla/oak and spice on the nose, plus pear and stone fruit in support. Medium-light bodied, with a smooth and somewhat flat mouthfeel and finish. Prix 2009 Syrah, “Reserve,” Napa Valley. Medium-dark purple, the bottle I tasted from seemed slightly oxidized but underneath that were bright aromas of plum and darker fruit, spice, pepper, and sweet oak. Medium-bodied with a fairly lively mouthfeel but a bit short on the finish. Comments: The first kosher winery in California, Hagafen was founded in 1979 by Ernie Weir and his wife Irit, and Ernie continues to make the wine there. Hagafen has two estate vineyards in Napa Valley and sources fruit from a number of other locations as well. Value-priced wines come out under the Don Ernesto label (that name was bestowed on Ernie by his vineyard workers in the winery’s early days) while the Prix label is for reserve wines. Kale 2013 Rosé, Napa Valley. 68% whole-cluster pressed Grenache and 32% saignée Syrah. Light salmon-pink color, with bright and spicy red fruits, a hint of flowers, and a savory component. Medium-light bodied with just a touch of tannic bite on the crisp, fresh finish, nice. Kale 2010 Syrah, “Spirit Rock,” Alder Springs Vineyard, Mendocino County. 96% Syrah, 4% Viognier. Medium-dark color, featuring a savory, herbal character along with dark berry fruit, flowers, black pepper, and a stony mineral note. Medium-full bodied with a vibrant mouthfeel and great structure, finishing with refined tannins. Intriguing and complex now, this should also age well. Kale 2011 “Home Run Cuvée,” Kick Ranch Vineyard, Sonoma County. 70% Syrah, 30% Grenache. Medium-dark color, this was more fruit-forward than the previous wine, with plum and blueberry, earth, spice, and vanilla/oak aromas. Richer mouthfeel, with a lively texture and grippier tannins on the finish. Comments: Kale Anderson started his label with his wife Ranko in 2008, focusing on Rhône-style wines. In the past, he’s worked for Mark Aubert at Colgin Cellars, and at Terra Valentine and Cliff Lede before joining Pahlmeyer in 2012 as director of winemaking for their Napa Valley wines. Red wines are mostly native fermentations in open-top stainless steel and French oak tanks. They get extended maceration and are aged about 18 months in 25%-33% new French oak. Kale was on hand to pour at the tasting, and he’s continuing to make some outstanding wines. Kieran Robinson 2010 Syrah, “Le Voyageur,” Bennett Valley. From 470 and 877 clones planted in 2001, fermented with 50% whole clusters, aged in 35% new oak. Medium-dark color, this showed savory/herbal aromas upfront, with plum and black cherry fruit, pepper, baking spice, and a touch of sweet oak. Medium-full bodied with a lively texture and the structure for aging, finishing with firm tannins – nice now and should benefit from more time in the cellar. Kieran Robinson 2009 Syrah, Vivio Vineyard, Bennett Valley. Made with 40% whole-cluster fermentation, aged in 40% new oak. Dark purple, with a riper fruit profile of darker berries, plus notes of smoke, chocolate, dried herbs, and undertones of vanilla/oak. Richer, smoother mouthfeel than the previous wine but still with good structure, this finished with grippy, chalky tannins. Comments: Kieran Robinson and his wife Kristie established the winery just a few years ago, with the first release coming from the 2009 vintage. Kieran is also the assistant winemaker at Jericho Canyon in Calistoga. Prior to that, he worked with Cakebread Cellars and Paul Hobbs, and with Pierre Gaillard in the Northern Rhône Valley. The winery’s early releases have been Syrahs from the cool Bennett Valley AVA. Kristie, who was pouring at the winery table when I stopped by, is also the Executive Director of the Napa Valley Museum. This was my first experience with Kieran Robinson wines and both bottlings were impressive. La Sirena 2010 “La Barrettage,” Calistoga, Napa Valley. 98% Syrah, 2% Petite Sirah, sourced from 50% each Barrett Vineyard and another site near St. Helena, aged in about 45% new oak. Very dark purple, featuring ripe plum and darker fruit, lots of spice and sweet oak, with hints of herbs and black olives. Rich mouthfeel, with a smooth texture and moderate tannins. La Sirena 2006 Syrah, Barrett Vineyards, Napa Valley. Library wine. 100% Syrah, aged in 45% new oak. Dark color, this had higher-toned aromas of plum and black cherry, along with vanilla/oak, spice, and earth. Big and bold, still structured on the palate, and finishing with fairly grippy tannins. Comments: La Sirena owner/winemaker Heidi Peterson Barrett needs little introduction – over the years, she’s made wine for high-end Napa labels including Screaming Eagle, Dalla Valle, Jones Family, Grace Family, Showkett, and many more. Her current winery clients include Amuse Bouche, Paradigm, Lamborn, Kenzo Estate, and Vin Perdu among others. Heidi founded her own La Sirena label in 1994 (the name means “The Mermaid” in both Spanish and Italian), and has made Syrah since 2000. Her small estate Barrett Vineyard is on a rocky hillside site near Calistoga. Heidi poured at the tasting, and she was generous enough to bring a library wine to pour alongside one of her current releases. Lightning 2013 “CdP Blanc,” Starr Ranch, Paso Robles. 52% Grenache Blanc, 32% Picpoul, 16% Roussanne, from a vineyard on the Westside of Paso Robles. Whole-cluster pressed, co-fermented in neutral oak and stainless steel, with 40% going through malolactic fermentation, and recently bottled. Light straw color, this displayed apple and stone fruit aromas, along with fresh herbs, and touches of citrus zest and earth. Medium-bodied with a fairly lively mouthfeel and fresh finish, nice. Lightning 2012 Grenache, Sonoma County. About 80% Grenache (Tablas and Alban clones), 20% Mourvèdre, sourced from Kick Ranch, on the northwest flank of Spring Mountain between Russian River Valley and Bennett Valley. Medium-light color, with earthy red fruits, spice, and an herbal note. Medium weight on the palate with moderate tannins on the finish. Lightning 2011 Syrah, Phoenix Ranch, Napa Valley. 100% Syrah, from a site near the base of Atlas Peak at the cooler southern end of the valley. Dark purple color, featuring plum and darker berry fruit, herbs, a touch of black pepper, and a big smoked meat component. Fairly rich yet lively texture with the structure for aging, and firm but refined tannins on the long finish – this was a standout young Syrah that should reward further time in the cellar. Comments: Randy and Brooke Hester left Texas and arrived in Napa in 2006, where Randy began working at Cakebread Cellars. Since then he’s worked with vintners including Andy Erickson, Michel Rolland, and Helen Keplinger at wineries such as Colgin, Caldwell, and Realm. 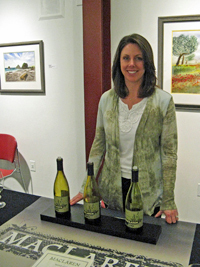 Brooke, who worked as CFO of Patz & Hall, handles the business side of the winery. A very new producer, 2011 was the first Lightning vintage. Reds are fermented with about 30% whole clusters in open-top barrels, given extended maceration, and aged on the lees in mostly older oak. 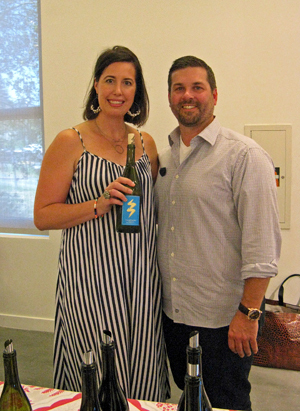 Both Randy and Brooke were on hand to pour their wines at the event. I was very impressed with these wines and look forward to following this new producer. MacLaren 2010 Syrah, Judge Family Vineyard, Bennett Valley. Aged for 12 months in 20% new French oak. Medium-dark color, this had savory/herbal aromas upfront along with higher-toned plum and darker berry fruit, fresh flowers, and a touch of black pepper. Medium-light weight on the palate with vibrant texture and a moderately tannic finish, nice. MacLaren 2010 Syrah, “Drouthy Neebors,” Sonoma County. Sourced from 50% Judge Family Vineyard in Bennett Valley, plus 25% Saralee's Trenton Station and 25% Samantha's Vineyard, both in Russian River Valley, aged in all neutral oak. Medium-dark purple, with bright black cherry, plum, black olive, and spice on the nose. Medium-bodied with juicy acidity and a slightly saline character along with chalky tannins on the finish, nice. MacLaren 2011 Syrah, Stagecoach Vineyard, Napa Valley. Not yet released. From a vineyard about 1,600 feet above Napa Valley, aged in about 20% new French oak. Dark color, with blackberry, dried herbs, and baking spices, with undertones of mocha and sweet oak. Richer mouthfeel than the first two wines, and a grippier tannic finish. MacLaren wines. This was my first experience with MacLaren, and the two 2010 bottlings were particular standouts. Miner 2012 “The Iliad,” Napa Valley. A new white blend. Light straw color, with floral and stone fruit aromas along with undertones of sweet oak. Medium-bodied with a fairly smooth texture and finish. Miner 2011 “The Odyssey,” Napa Valley. 63% Grenache, 22% Mourvèdre, 15% Syrah, sourced from Stagecoach, Palisades, and Naggiar vineyards, aged in 40% new French oak. Light garnet color, this featured higher-toned red fruits, earth, and spice on the nose. Medium weight and lively in the mouth, with a stony mineral note along with moderately grippy tannins on the finish – an intriguing wine that could use a couple of years in the cellar to develop. La Diligence 2009 Syrah, Stagecoach Vineyard, Napa Valley. 100% Syrah, aged in 40% new French oak. Dark color, displaying spicy dark berry fruit, chocolate, a savory note, and vanilla/oak. Big, fairly rich, and structured on the palate, with bigger but refined tannins on the finish. Comments: Dave and Emily Miner established their winery in 1996, in the Oakville portion of Napa Valley. Winemaker Gary Brookman joined them the following year after working at Franciscan and Joseph Phelps, and he continues to head up the Miner winemaking team. Sourced from Stagecoach Vineyard, La Diligence (“The Stagecoach” in French) is a joint effort of Miner and noted Northern Rhône Valley producer Domaine François Villard. Petrichor 2013 Rosé, Estate, Sonoma County. About 50% each Grenache and Syrah, whole-cluster pressed. Light salmon color, showing bright and herbal strawberry fruit with touches of spice and flowers. Medium-light weight with a vibrant mouthfeel and a chalky mineral note on the finish, nice. Petrichor 2011 “Les Trois,” Estate, Sonoma County. 70% Syrah, 30% Grenache, with about 60% of the Syrah fermented with whole clusters. Medium purple color, this had bright, higher-toned black cherry and plum fruit, smoked meat, a touch of black pepper, and lots of spice. Medium-bodied and lively on the palate, with a tangy finish and fairly big but refined tannins, nice now and should age well. Petrichor 2012 “Les Trois,” Estate, Sonoma County. Not yet released. About 50% each Syrah and Grenache. Medium color, with raspberry and darker fruit, earth, spice, and a slightly stony mineral note. Slightly bigger mouthfeel than the previous wine, with grippy, chalky tannins, this one is clearly still a baby but shows good potential. Comments: Petrichor (it means “the scent of rain on dry earth”) is the label of Jim Foley and Margaret Bradley-Foley, and their first release was from the 2009 vintage. They’ve assembled an all-star team, including winemaker Duncan Meyers of Arnot-Roberts, vineyard manager Lee Martinelli Jr., and consulting viticulturist Steve Matthiasson. The estate vineyard is located in the Mayacamas Mountains above Russian River Valley. The name “Les Trois” refers to the Syrah clones included – 877 and 470 – plus Alban clone Grenache. 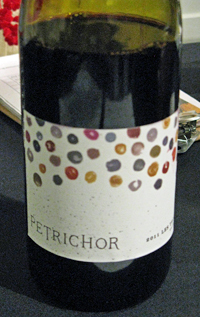 Margaret was on hand to pour the latest Petrichor wines, and they continue to be impressive. Prospect 772 2010 “The Brat,” Calaveras County, Sierra Foothills. 63% Grenache, 37% Syrah, co-fermented with 15% whole clusters, aged in about 50% new French oak. Medium-dark purple color, with blackberry, lots of spice, and vanilla/oak overtones. Medium-full bodied with a fairly smooth texture and a firm tannic finish. Prospect 772 2010 “The Brawler,” Calaveras County, Sierra Foothills. 93% Syrah, 7% Viognier, co-fermented with 15% whole clusters, aged in about 50% new French oak. Dark color, this featured dark berry fruits, touches of pepper, black olives, and mocha, spicy oak, and a stony mineral note. Very big and rich on the palate, with grippy tannins – nice effort in this style. Comments: Ron Pieretti and Wendy Sanda are proprietors of Prospect 772, which they launched about 10 years ago. Their Appaloosa Estate Vineyard, located near Angels Camp in Calaveras County, is planted to Rhône grape varieties including Syrah, Grenache, and Viognier. Jeff Cohn of JC Cellars is the winemaker. Ridge 2012 Carignane, Buchignani Ranch, Sonoma County. A small-production bottling from 75-year old head-trained vines in the hills north of Dry Creek Valley. Medium-dark purple color, with bright red fruits, earth, exotic spices, a stony mineral component, and a touch of vanilla/oak. Medium-bodied with a lively mouthfeel and moderate tannins on the finish, nice. Ridge 2010 Syrah/Grenache, Lytton Estate, Dry Creek Valley. About 50% each younger-vine Syrah and 100-year old Grenache, entirely destemmed. Darker color, this featured dark berry fruits, spice, and vanilla/oak. Richer mouthfeel with a firmly tannic finish. Comments: Ridge is one of California’s most renowned wineries, founded in 1959 in the Santa Cruz Mountains but with a vineyard history that goes back to the 1880s. Paul Draper joined Ridge in 1969 and continues to head their winemaking team. Ridge has produced wines from Dry Creek Valley since the mid-1960s, and purchased their Lytton Springs property there in 1991. John Olney has been in charge of winemaking at Lytton Springs since 1999. The winemaking has long been known as striving for minimal intervention, as well as for using mostly air-dried American oak for barrel-aging the wines. Stark 2011 Viognier, Damiano Vineyard, Sierra Foothills. Made in 50% each stainless steel and neutral oak. Light straw color, this had higher-toned and ripe floral and tropical fruit aromas. Medium weight with moderate acidity and a tangy finish. Stark 2012 Carignane, Trimble Vineyard, Mendocino County. Medium color, with plum and black cherry fruit, spice, and dried herb notes. Medium-bodied, with a smoother texture and moderate tannins. Stark 2011 Syrah, Eaglepoint Ranch, Mendocino County. Fermented with about 30% whole clusters. Medium-dark color, featuring plum and darker berry fruit, spice, and touches of pepper and black olives. Medium-full bodied, this had a lively mouthfeel and a firm tannic finish, nice. Stark 2012 Petite Sirah, Damiano Vineyard, Sierra Foothills. Made in a concrete egg. Medium-dark color, this showed blackberry, plenty of black pepper, and spice on the nose. Big and rich on the palate, this finished with surprisingly smooth tannins, nice. Comments: Winemaker Christian Stark and his wife Jen have run their Sonoma County winery since 2002. The fruit for the Stark wines comes from a broad area. Damiano Vineyard was planted in 1997 and is located near Auburn, farther north than most Sierra Foothills vineyard sources. Trimble Vineyard’s dry-farmed head-trained Carignane vines date back to 1942. Eaglepoint Ranch is located in the hills east of Ukiah. 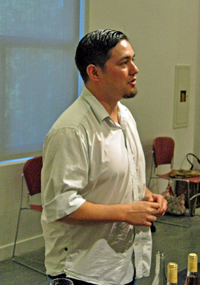 Christian started on his career path as a chef, and seeks to make wine to go with food. He was behind the table to pour his wines at the tasting, and I particularly liked the Syrah and Petite Sirah. Two Shepherds 2012 Grenache Blanc, Saarloos Vineyard, Santa Ynez Valley. Fermented and aged on the lees mostly in neutral oak and some stainless steel. Light straw color, with intense apple and stone fruit, fresh herbs, and a leesy note. Medium-light bodied with a smooth texture but a crisp finish. Two Shepherds 2012 “Pastoral Blanc,” Saralee’s Vineyard, Russian River Valley. 50% Roussanne, 35% Marsanne, 10% Viognier, 5% Grenache Blanc, fermented and aged on the lees in neutral oak. Light straw/yellow color, this featured slightly higher-toned aromas of pear and stone fruit, along with spice and a stony mineral note. Medium weight and lively with a chalky sensation on the finish – intriguing now but could use some time in the cellar to integrate the components. Two Shepherds 2013 Grenache Gris Rosé, Gibson Ranch, Mendocino County. First Rosé from the winery, from 105-year old dry-farmed and head-trained vines, the fruit was crushed and left on the skins for seven days before pressing. Light pink/salmon color, displaying bright red berry fruit, fresh herbs, and an earthy note. Medium-light bodied with a vibrant texture and a touch of chalky tannin on the finish, nice. Two Shepherds 2012 Grenache, Saralee’s Vineyard, Russian River Valley. 100% Grenache, fermented with about 70% whole clusters, aged in neutral oak. Medium-light color, showing higher-toned red fruits and dried herbs on the nose. Medium weight with a fairly smooth mouthfeel and moderate tannins. Two Shepherds 2011 “Syrah/Mourvèdre,” Russian River Valley/El Dorado County. 55% Syrah from Saralee’s Vineyard and 45% Mourvèdre from a site farmed by Ron Mansfield in El Dorado, aged in neutral oak. Medium-dark color, this had bright aromas of plum and darker fruit, with savory/herb notes and undertones of earth and iron. Medium-bodied with a lively character and a somewhat grippy tannic finish, nice. Comments: Two Shepherds is a Rhône specialist, producing both varietal wines and blends sourced from a number of California wine regions. The first commercial vintage was 2010. 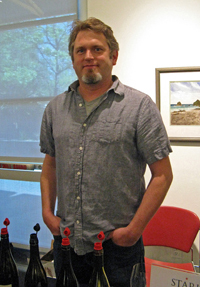 Owner/winemaker William Allen is well-known for his Simple Hedonisms wine blog. William is one of the few vintners who has been able to continue sourcing fruit from Saralee’s Vineyard in Russian River Valley since it was sold in late 2012 to Jackson Family Wines. William poured his wines at the event, and I thought this was the best showing of the Two Shepherds wines that I’ve tasted. Comments: Nile and Whitney Fisher Zacherle have been proprietors of their eponymous winery for ten years. Nile is also the winemaker for David Arthur Vineyards and Montagna Napa Valley, while Whitney grew up surrounded by wine at her family’s famed Fisher Vineyards, where she has made the wines since 2002. In addition to their “Las Tres Hermanas” red blend, the winery has also produced Riesling, Viognier, Pinot Noir, Syrah, Cabernet, and a sparkling Rosé of Syrah.